Imagine that, as a young student, your sights are set on making a difference in the world. You’re excited about launching your career in a groundbreaking industry, applying your education to one of the STEM disciplines. Medical research fascinates you, not only because of the scientific process, but because it’s your chance to make a positive impact on people’s lives. So you join a small medical device company whose organizational purpose appears to align with your own aspirations. You’re assigned to a team of like-minded peers and you get to work on a device that protects millions of people each year. All’s going to plan. But then your organization is acquired by a powerhouse pharmaceutical company that jacks up the price of the product – 550 percent over several years. People around the world are angered. They can no longer afford what is, for some, the difference between life and death. The government and the press take your entire firm to task. The company agrees to a $465M settlement with the U.S. Department of Justice for misclassifying the product as generic. And in the midst of all this, you learn the CEO of your company—your leader—has taken home a mind-blowing performance bonus. Your heart sinks. You feel betrayed. And you check out. We are, of course, talking about the harsh reality faced by the employees of Mylan, the pharmaceutical giant that’s under fire and at the center of the EpiPen debate. It will be next to impossible for Mylan to convince its key stakeholders—patients, parents, regulators, and especially employees—that its company mission is to improve the lives of others. Because fairly or not, Mylan’s actions have cemented the belief that its core organizational purpose is to maximize profits above all else. Much of the Mylan debacle has centered on its aggressive business practices. But the real damage will run far deeper than the financial strain imposed on patients and insurance companies. If the true leaders in medical research want to make a difference, they will root out the bad apples in the industry and strike a reasonable balance between making a profit and fulfilling the promise of saving lives. If they don’t, Pharma’s reputation will continue to slide, and the ability to develop a new generation of adventurous researchers will be kneecapped. This may feel like payback for a greedy industry, but ultimately we’ll all pay the price of medical research stagnation. 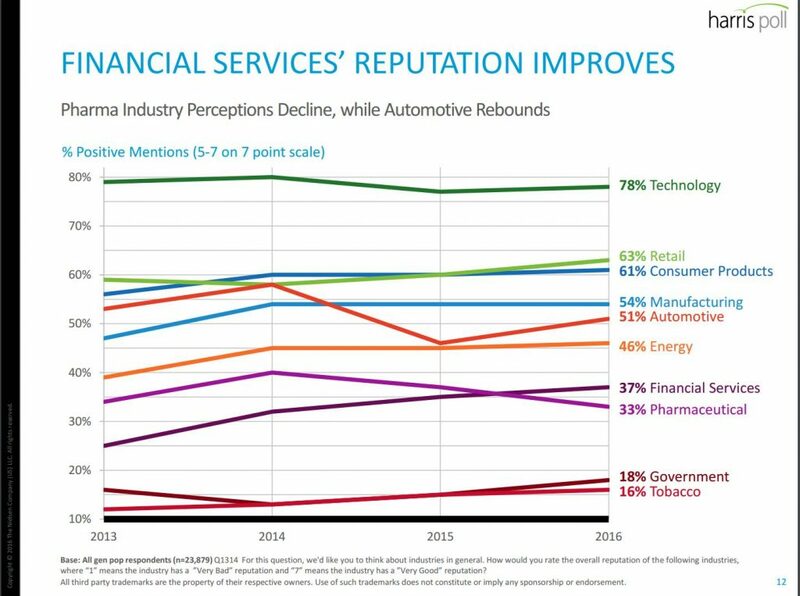 For a direct comparison look no further than Financial Services, whose reputation is now slightly higher than that of the pharmaceutical firms (see Fig 1). Banks were already viewed with suspicion prior to the 2008 collapse, but what they lacked in reputation they made up for in swashbuckling excitement and dizzying bonuses. Post-recession, with more skeletons being pulled out of the financial closet (see Wells Fargo, HSBC, LIBOR rate fixing etc.) and with heavy regulatory oversight and compliance requirements, banks are struggling to attract and retain qualified staff. Those millennials who do join big banks leave the industry before planning on moving up. And remember, unlike molecular biology, financial skills learned on Wall Street are highly transferable to other industries. Industries and companies with poor reputations can still staff their divisions, but they often incur a ‘reputation penalty’ in the form of higher salaries, lower expectations, smaller selection pool, and more perks. Organizational purpose drives the career choices of graduates who seek this as much as the potential financial reward. As people progress in their careers they report the importance of meaning in work increasing. The notion of organizational purpose and knowing your time spent at work contributes something positive in the world is a powerful force. Top Workplaces organizations already recognize this. That’s why they infuse meaning and purpose by not only defining an inspiring mission statement, but living it too.